Bayoumy and Scott Russell preparing a turbine for an experiment. Amro Bayoumy ‘20 is a mechanical engineering major who hails from Egypt. Under the guidance of his mentor, Assistant Professor Jessica Shang, he is studying how to optimize the design and layout of wind turbines to create an efficient wind farm. Bayoumy’s project was developed after he applied to the program. Bayoumy is excited to get hands-on experience in fluid dynamics. He appreciates Shang’s guidance and the learning opportunities he gets in her lab. As part of his project, Bayoumy researched the best methods for optimizing the layout of wind farms in low-speed environments, and how to manage the wake from upstream turbines that can interfere with downstream ones. 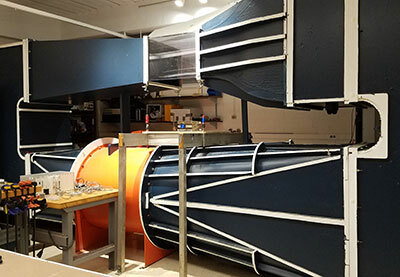 The wind tunnel in which Bayoumy conducts experiments. To do this, he designed model turbines, printed them using a 3-D printer, and used the wind tunnel in Gavett to conduct his experiments. 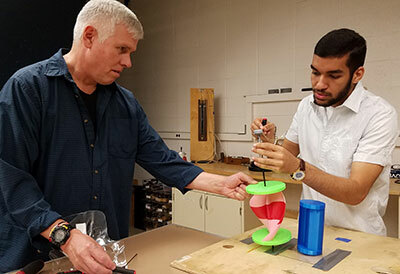 Scott Russell, a lecturer and the senior technical associate of the Department of Mechanical Engineering, guided Bayoumy in printing his turbines and running the experiments. For example, he is learning to use machine learning algorithms in this project, which he otherwise wouldn’t learn in his classes. He is also learning about the applications of fluid dynamics outside of a classroom setting. 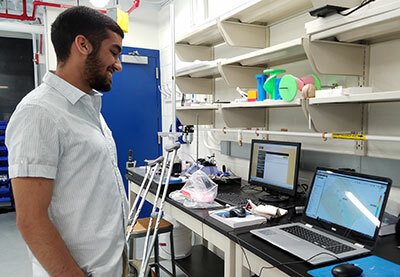 Along with the XEROX Scholars program, Bayoumy was also accepted to two other research programs, DAAD-RISE in Germany and the Summer Undergraduate Research Programme (SURP) at the Chinese University in Hong Kong. Bayoumy chose to stay in Rochester because he wanted to get research experience at his own university. He’s excited to meet more of the professors in his department and learn more about academia and research. Bayoumy hopes to have a sustainable project that he can work on even after the summer. Bayoumy in his lab space, demonstrating his wind tunnel simulations.